I was thinking about all of the things a CAD Manager does and decided to start a list. It was very long. At the highest level the list is typically support, training, and development – a very basic IT management framework. That is, get feedback from support and address systemic issues first with training and if necessary with development. Of course, the details of the day to day activities of a CAD Manager paint a much more complex picture. 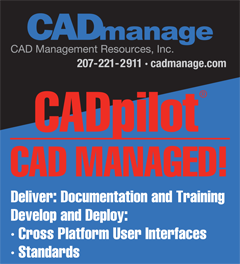 The CAD Manager doesn’t just have to know how to reset passwords. The CAD Manager also has to be able to peel back the layers of the CAD system one by one to separate the relevant from the irrelevant. CAD support might appear to be as simple as demonstrating feature function, but more often it requires traversing multiple integrated systems. A few years back I had a situation where several users were seeing really poor performance, but only when working in a CAD drawing. Basic drawing commands – lines, circles, boxes and text were really slow. Everyone had the same software, the same computer, the same OS, but only a handful of users were seeing performance degradation. What gives? In large corporations there are large IT teams and on occasion they can be a challenge to work with. Their requests can seem ridiculous at times, but usually these requests or “push-backs” are opportunities to eliminate a suspected root cause. In this case, our IT partners were skeptical and told us that we were imagining the performance issue. Ok. A simple timing script resolved that. I created a macro to place objects into a drawing. Pretty simple really – time stamp before and after and take the difference between the two. In VBA use the timer function. The output will be in seconds. Test some stuff, but be sure that your macro tests remote resources not just local desktop operations. Open a file, or place a block (or cell) that resides on a server. If you want to run a file open test, run it from a VBS. The test did the job. We were able to prove that performance was bad on these select machines. Still no root cause, but we proved the problem existed. The next “push-back” – well it must be the CAD software. Hmm. I thought I had done enough, but I went ahead and stepped through my checklist (working inside out) – drawings same problem with a new/different drawings so it can’t be drawing file specific, data connections not applicable, CAD application versions and settings are the same, CAD engine configurations the same. There weren’t any differences related to the CAD environment. Volley back to IT. At this point I had the evidence to demonstrate that the problem wasn’t due to the CAD environment. This meant that our IT partners now had to take a closer look at the differences in the desktop programs and utilities that they managed. This included many things including network, terminal windows, OS system and patches. Network diagnostics checked out, OS system and patches ok, anti-virus software was the same, but… there was a difference. Turns out the AVS settings were not the same. On the computers with the problem the check box to scan remote computers was checked. Every time the CAD program grabbed a file or resource from the server it was being scanned. A systematic analysis of each component of our design automation platform eventually found the root cause. And, in this case the resolution was relatively simple. That is, turn off remote detection. No need for redundant scans of internally managed servers. We’re introducing a new blog post this month for our CADpilot users. I will be adding at least one new tip per month and if there is a topic you would like me cover send me an email at info@cadmanage.com or fill out our contact us form located on our main cadmanage.com page. Do you prefer to work with lists of information? Do you have many levels or cells/blocks to chose from and need a quick and easy way to organize…with non-cryptic descriptions? TabLists are the answer to display and execute commands in a list format. Ask your CadPilot administrator to setup a TabList for you. The following is an example of a TabList and instructions on navigating and using TabLists. Use your mouse to select the applicable category tab, then click on the desired name (level name in this example) to execute the command. The arrows keys may also be used to navigate the tabs and commands within the list(s). Down arrow key navigates down through the current list. Up arrow key navigates up through the current list. <PageUp> key navigates up through the list a page at a time. <PageDn> key navigates down through the list a page at a time. <Enter> key activates the currently selected item. Ok, so we’re going to get down to the basics here, what is the best way to zoom in AutoCAD and MicroStation? Well, as it turns out, they both work exactly the same (for the most part). Basically, you use the middle mouse button by itself, or with some kind of keyboard combination. MBUTTONPAN will toggle whether the middle mouse button will support the action defined in the CUI file or pan. You can also pan by holding down the SHIFT+Left Mouse Button, and moving your mouse. If you snap (left+right mouse buttons) to an element, you will center the 3D orbit point.